I haven't looked through pictures that I took during the Baton Rouge flood that occurred back in August. It is my home town. All of our family are there. It was a scary and devastating time for many of our friends and family. However, I recently started seeing headlines stating that it had been 100 days since the flood and it got me reflecting on all that has happened. This was not like a hurricane that people knew was coming. It rained. And it rained a lot. It was simply a storm with no name but it dropped about 2 feet of rain on Baton Rouge and surrounding areas over a 3 day period. Some people think that the Mississippi River flooded but it didn't. In Baton Rouge, it was the Amite River and all of the many little tributaries that run throughout the town that flooded. 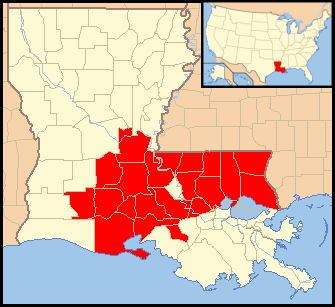 Areas of Louisiana that have never flooded in recorded history were under water. Almost 189,000 homes across 20 parishes (about 10,000 square miles!) were damaged or destroyed. Overall, it has affected about 500,000 people - that's half a million people or 11% of the population of Louisiana. Sadly at least 13 people died. Although we don't live in Baton Rouge anymore, my parents, my brother Steve, and many of my friends are there. Stuart's parents and brother (also named Steve) are there as well. So as we heard news of flooding we started praying and checking on our families and loved ones. I'm the family worrier so it was really hard on me being so far away and hearing only bits and pieces about what was happening. There were lots of phone calls, text messages, emails, and Facebook messaging to our family members and friends. Unfortunately cell service was down for a big portion of the time when the flood waters were actively moving which made it even harder to know what was really going on. For reference, Stuart's parents live in Central (see red pin on map below) and my family is all located in Baton Rouge around the Sherwood Forest and Broadmoor areas (see blue pin on map below). You can see where the Amite River is. It is what flooded and the waters just flowed out from there. Kim: I'm seeing friends in Baton Rouge posting on Facebook about flooding. How are you guys? Steve? Dad: Heavy and steady rains last night but I have seen no flooding. Office and home are both high enough. Kim: That's good news. Stay safe. I love you guys and miss you all! We are fine. But Steve and Donna are without electricity. There is a police car in front of the house of our corner neighbor keeping people from driving further back down the street. Ed went and did his volunteer work yesterday morning and I went to work. Ed called me at about 12:30 to tell me to come home because the roads were getting impassable. (He was half-way home at the time). He called again at 1 to say "Get up out of your chair, go to your car, drive home, now." At 1:30 I left and I got home by 2:30. Greenwell Springs Rd was closed near the central thruway so I had to go Sullivan/Wax. At Central High there was a barricade in the middle of the road but the other drivers and I drove around it. A hundred feet further water was pouring across Wax Rd like a roaring river. There were lakes everywhere. Steve just called and said he had a text from John (In George-Jades subdivision) and they have water in their house and friends are there trying to save some of their furniture. Steve says his own situation doesn't become serious until the battery runs out in Alyssa's feeding tube and oxygen. But he says a neighbor has a generator. We have just taken some pictures from the front porch and back porch. If we knew how to send pictures, we would email them. We will keep you informed. Stuart saw this email around 10:00, about 30 minutes after his mom sent it. He called her right away. She sounded frantic and said that the flood water had reached the house and was starting to seep into the dining room at the front of the house. She and Ed were using towels and a wet dry vac to try to get the water up. Their yard slopes up from the street so their house is high. They have never had any hint of a concern about flooding in all the 30 plus years they have lived there. Stuart let her get off the phone to get back to what they were doing. Kim: Stuart just talked to his parents and they have flood water coming into their house now! They are on high ground and have never had anything like this happen. Are you guys still OK? Stuart and I talked about how quickly the water had risen at his parents' house and Stuart called his mom right back and told his mom to quit trying to clean up the water, salvage important things, and get out of the house now. 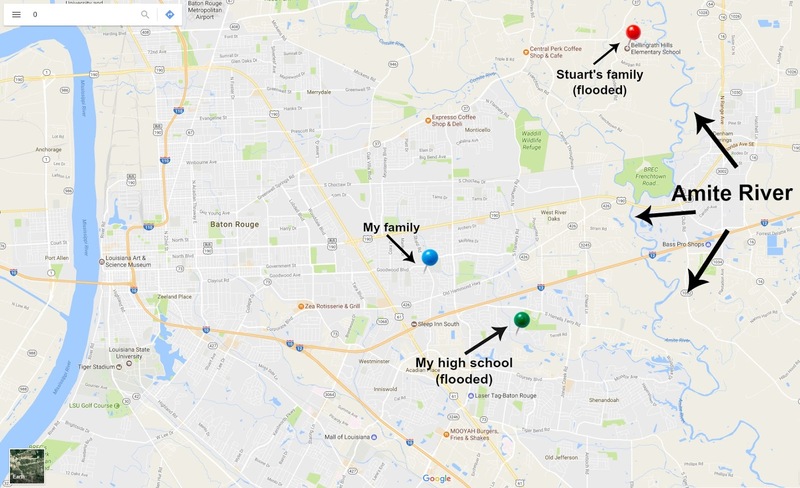 Stuart sent a text message to his brother who lives in the Baton Rouge area to let him know what was going on at their parents' house. He was not aware. They were having trouble communicating with each other and neither could get in touch with their parents anymore. The AT&T cell tower had lost power and the generator apparently wasn't working so communication all over town was lost for a lot of people. Stuart told his brother that he had heard that a man had fallen while walking through flood water and had drowned. His brother told him he had encountered 5 road blocks due to high water the day before and two were on major roads. He has also seen 2 vehicles that had been swept away in the water. We tried to call Stuart's parents many more times but got no answer. I also got no response from my family. You can imagine that we were both feeling so helpless and worried for our parents. At this point we still didn't understand what was happening or where all of the flood water was coming from. It was all just so sudden. Stuart's parents called him. They decided to leave the house and opened the back door to go to the car. There was water up to their knees. Backed car out of driveway but water was up to the car windows when they got to the bottom of the driveway. The car started floating down the road and they could not open the doors to get out. Fortunately they were rescued by good citizens who got out in their boat to rescue people (aka The Cajun Navy). They were taken to the local elementary school for shelter. But water will be at the school soon. Stuart's dad doesn't have his glasses, his phone screen is broken and he can't call out. They had to get off the phone. I think they were using a phone from someone else in the shelter. Stuart is not sure if his dad got his diabetes meds, and we aren't sure if they got their dog. I started stalking Facebook. Friends were posting about flooding in their area and it helped me as I tried to figure out where the waters were. Then Facebook groups started getting created to help get Cajun Navy rescuers connected with people in the flood such as Louisiana Flood Rescue Aug 2016 and The Cajun Navy. It was just amazing to watch it all unfold. Ordinary citizens put their cell phone numbers on these Facebook pages and gave out their location. People posted descriptions and addresses of loved ones that were flooded or perhaps were unaccounted for. People got connected. Hours and hours and hours of constant work for the rescuers. The pleas and the struggles posted on these pages were so hard to read yet I was glued to it. Were they anyone I knew? Where was that address? Is it close to my family? Where does the flood seem to be heading next? My constant monitoring of these pages made my stress level skyrocket but I couldn't pull myself away. There was a story posted about a family who was searching for their lost child. Another story included a picture that an adult daughter posted of her elderly mother just laying in her medical bed in her bedroom as the water is several inches high on the floor. The daughter couldn't lift her out of bed and the mom was too weak to get out of bed herself. Their neighbors had already evacuated and they needed help fast. But with each story there would be 10 people posting trying to offer help in some way. My Louisiana pride was bursting to see my home town community pull together in an amazing effort to help total strangers. I still couldn't get over how this was all happening. It was all so sudden. This is my home town. What will happen to the people in these flooded area? How much more destruction will these waters cause before they stop? We finally got more information about Stuart's parents. They didn't get their medication but they did save their dog. 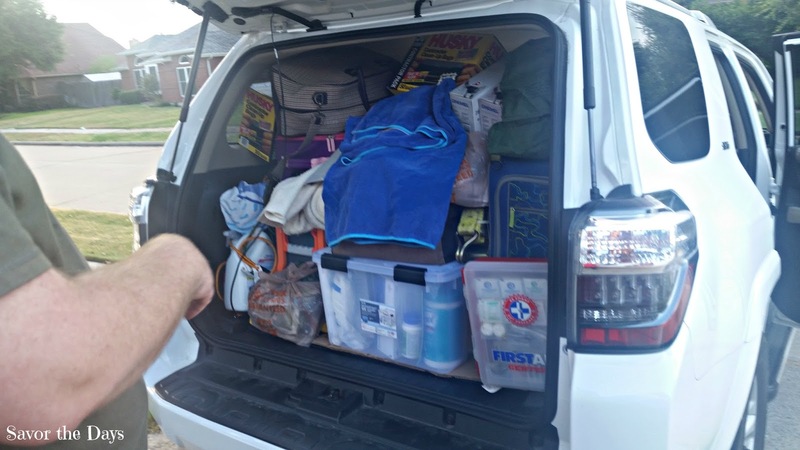 When they were getting in their car they had put all of their belongings in the trunk. When they were being rescued as their car was floating down the street, the men had to pull them up through the windows and into the boat. They obviously did not bother to get anything out of the trunk so Stuart's parents had nothing but the clothes on their backs. We also found out that they did not have flood insurance because they were not in an area that had any concern about flooding. The water was rising at the school that were sheltering in so the plan was to take them out of the neighborhood by boat (aka Cajun Uber) and get them to a shelter farther away. However, shelters were starting to fill up and there was a concern that they might not have anywhere to go. We couldn't find any new coverage on TV but the Baton Rouge news station WBRZ had video coverage of boat rescues happening around Central where Stuart's parents were. We never saw them in any of the videos. Stuart and his brother talked a lot about next steps. His brother would try to determine which shelter they would go to, pick them up, and get them into a hotel for the night. However, hotels were already getting booked up. He was finally able to get a reservation but they wouldn't take his credit card over the phone. He had to go to the hotel in person to finalize the reservation. That meant that he had to travel across town which is flooding, barricades are up in places, and traffic is a mess. But he made it and secured one of the last rooms. Saturday, 8/13/2016, 6:37 pm - Stuart got a text message from his brother stating that their parents would be moving to another shelter but they were waiting on a bigger boat and they didn't know where they would be taken. Steve 8:32 pm: I'm up next for a room! Steve 8:44 pm: They made it out. They are at Oak Point Shopping Center and are going to Central Middle School. As soon as I get the room I'm heading over there. Stuart 8:45 pm: Great news! Let me know when you have them. Stuart 9:41 pm: Any update? Steve 10:02 pm: I'm trying to figure out a way to get them. So far it looks like everything is blocked going out to Central. Stuart 10:03 pm: Call the sheriff's office and see if they can help you. Steve 10:03 pm: I did call them they were completely useless. They said they didn't have a list of any roads that were open. Mom said they didn't seem to have anybody in charge at the school. Steve 10:07 pm: I just tried dad. I didn't get an answer. I don't know if he's asleep or the phone is dead. "My in-laws have been boated out of their subdivision and they are being taken to Central Middle School on Sullivan Rd. My brother in-law is trying to get to them but so many roads are closed. He is in the Baker/Zachary area right now trying every route he can think of. If you know any way that he can get from there to Sullivan Rd please let me know." I got replies from others in the same situation but no suggestions for help. Everyone there was in their own world of stress. Stuart 10:40 pm: Does one of your work buddies have an SUV or tall truck that can get through the water like that city bus did? Stuart 11:15 pm: Did you make it home? Steve 11:16 pm: Just got home. Ate for the first time since noon. Stuart 11:17 pm: Glad you are home. Thanks for all you've done today for mom and dad. If you do get someone with a truck to help, should probably bring a small step ladder to help them get into the truck. Steve 11:41 pm: Good thinking. I'm on highway 958 headed to Tucker. Stuart and his brother got on the phone and they worked together to try to get their parents out of the shelter. Steve was driving trying to get to the school but he kept hitting flooded roads or road blocks. Stuart was in Texas looking at maps and checking news reports of flooding, trying to help direct his brother down alternate routes to the school. They did this for about 2 hours without success. At around 2:00 am they called it a night. Their parents were safe in the shelter for the night. They would pick up the attempt to get them out in the morning. Sunday morning, Stuart's brother was going to keep trying to find a route to get to his parents at the shelter. We still could not find news coverage of the flood on TV but saw on Facebook that friends and WBRZ were reporting that the flood waters were continuing to spread across town. It was so hard to get a clear report of where the floods were heading. Kim: How are you guys doing? It seems like there is still more flooding from what I can gather. Praying for you all! 8:49 am: How is your house? I can't tell where the flooding is but it seems like it is still spreading. 9:24 am: If you are getting this please answer. I just want to know that everyone is safe. I tried calling my Dad and my brother multiple times but the calls weren't getting through. I would just get a recording that the Network was not available. It's Sunday morning. With all the devastation back home, we needed to get to church. We wanted to praise God for keeping Stuart's family safe yesterday and we just kept praying that my family was safe. We went to church for the 9:30 service and I was just in a daze the whole time before the service. During the worship music, I cried pretty much non-stop. Not just a little tear running down the cheek. I'm talking big ugly cry. The poor lady next to me had no idea why I was crying but she hugged me. So many thoughts were going through my mind. I knew the flood waters had been close to my family last night and I saw updates on Facebook with people begging for rescues in areas near them. I could not get in touch with anyone. My mom is often too sick to get out of bed. My dad is recovering from three broken ribs and a punctured lung. Neither of them are in the best of health to have to be rescued from a flood. My dad often brushes me off when I talk to him about concerns that he might need to prepare and stock up for a natural disaster such as this. I couldn't help but wonder had he been too confident that he was on high ground and brushed off the concerns about water getting close and stayed in the house too long. "More prayers please! I talked with my family last night and they were OK but I can't get in touch with my brother or my parents today. From what I can tell floods are still rising and it seems to be in their area but reports are so sketchy. My dad is recovering from 3 broken ribs and my mom is so weak and sick that she stays in bed most of the time. Please pray that they are safe. 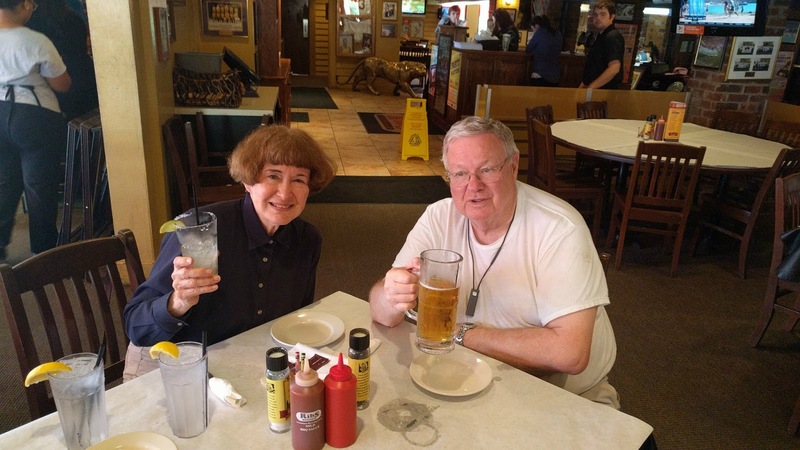 Good news - my in-laws made it out of the shelter this morning and are safe in a hotel room." A friend in Baton Rouge replied "AT&T is down. Only text with wifi. Or call using wifi. So they may not be able to get u." Kim: "Thanks. I assumed there are phone issues but even texts aren't getting answered but they may not have electricity for WiFi. I'm just worried and want to hear from them." Kim 11:34 am: I'm so worried about you all. I know phones may not be working and you may not have power but if you get this please please please let me know what going on. Dad 11:44 am: Got your email but I think phone and text with AT&T is down. I am at GOHSEP (Governor's Office of Homeland Security and Emergency Preparedness) with the Civil Air Patrol (note: he's a CAP member). We had 3 planes airborne this AM to get photos. Steve sent me a note that water was rising but I saw nothing this AM. We are ok. I think Steve may have lost power but I had it when I left home at 9. Kim 11:50 am: Thank God! I've been so worried. Steve has that creek right behind his house and there is lots of little creeks flooding so I'm really worried about him. Is there any concern about your house flooding? Is mom feeling ok? Is she awake to know if water starts coming in? Please understand that the only info I'm seeing is lots of cries for help on Facebook so it all sounds really bad to me. I heard there was water around Sherwood at St Thomas moor. I'm not sure where that is but that seems close to you guys. Dad 12:04 pm: We are ok so pls stop worrying. Dad: Office is high and dry. It drove me crazy that he was so unconcerned and gave me such short responses. All that I was seeing showed devastation, people crying out for help, flood waters rising everywhere. And I was worried about my mom who was at home alone, possibly sleeping and not knowing if the waters were getting close to her. We went to Walmart, they have a tooth brush, deodorant and a bed for Cricket. I have taken them to a first aid station to get some first aid, see attached picture. Steve managed to get them out of the shelter and taken them to lunch at TJ Ribs on Acadian Thruway. They have nothing but what you see. Their house and both cars have flooded. But praise be to God that they are safe. Kim 1:58 pm: Someone just said people are evacuating Woodland Ridge. That's where Episcopal High School is? And near your office? Dad 2:22 pm: Am safe. Stop worrying. Gurgle, gurgle, gurgle. Kim: Are you still at CAP? What all is happening there? You mentioned aerial photos. Do you have any info for me so I can understand what is really happening? Is it still raining? When do they think the flooding will stop? Calls are still not getting through to Baton Rouge and I haven't heard anything in quite a while but I can tell from Facebook that water has flooded the neighborhood where my high school is. It is close enough to walk from the school to my Dad's office so I knew the water was getting very close to him. He is self-employed and his income pays for all of my mom's medical needs, medications, health insurance etc. I was so worried about what would happen to them if he lost his business. Here is a video someone posted of Woodland Ridge and my high school on this day. "I haven't heard from my brother since yesterday and my Dad is no longer responding. The flood waters are closing in on their area and it will be dark soon. I wish we were there to help them." Stuart has taken my phone away from me twice today. Stalking Facebook and email all day long for flood updates is stressful and exhausting. I can't focus on anything else though. The floods just keep spreading! Praying the floods stop quickly and the water recedes and that my parents and brother stay safe and dry. "We've heard from dad and my brother. They are fine but it is flooding everywhere so I don't even know where they can evacuate to. Please pray the floods don't reach them." Steve 9:39 pm: hey kim, our houses are all dry now and everyone is safe and dry, phones should be fixed tonight sometime. we'll keep you updated. Kim 9:41 pm: Ok, I guess I'm just worried that you and they won't know it is getting serious until it is too late. Steve: 9:41 pm: I'll make sure we're all safe and dry. Stop stressing so much. Friend: "I've been doing the same thing...making myself crazy. Where do your parents and brother live now?" Kim: "Mom and Dad are on Old Hammond between Sherwood and Sharp/Cedarcrest. My brother is in Broadmoor"
Friend: "your parents area flooded but Broadmoor is fine! Lets pray they evacuated to his house. If they are on AT&T it was down all day. Their switching station on Choctaw flooded. Deep breaths!" I was able to get in touch with my brother's girlfriend on Facebook and she reassured me that my parents' area has NOT flooded and that their house and my brother's were dry. I tried to sleep but it was a restless night. I kept the phone under my pillow the whole night. I heard my brother's text as soon as it came through. Steve: I'm at Dad's and we're all safe and dry. Don't worry. I thanked him for the update but my tired and overworked imagination assumed the worst. I couldn't imagine why he would have gotten up and gone to my parents' house at 5 in the morning unless there was concern about the waters getting close to the house soon and they were monitoring it more closely and maybe packing up some things to get ready to leave in a few hours. I assumed my brother was busy so I didn't ask anymore questions and just waited for an update. I gave up on sleep and went downstairs. I just sat in the dark and prayed. I had prayed continually over the last two days but this just felt more intense. I prayed for a bubble to just contain the floods and stop them from spreading any further. I've never prayed so hard and so helplessly. I started imagining what they were doing. Packing a bag of essentials and their most important things. Was mom scared? Did mom have enough of her medicines to last a week or so if the pharmacies were flooded and couldn't refill anything for a while. Mom doesn't like to drive in the dark so I imagined that my brother and Dad were having to figure out how to get both cars to higher ground. Kim: I imagine they are leaving. Are you guys able to get mom's car out too? A short time later my brother called me. He seemed confused about my text but explained that they were fine. He reassured me that they were not in any imminent danger of being flooded. He said that they were just sitting in the living room watching the news but they were not worried. The river had crested and the spread of the flood waters were slowing down. He said the house was not going to flood. I felt so much relief and quite foolish for all of the scenarios I had imagined over the last hour. I got off the phone and just sat in the dark and prayed. I thanked the Lord for keeping our families safe. I prayed for recovery for those still trapped in their homes. I prayed that my home town would be able to recover from this devastation soon. I prayed that some people would be drawn closer to God through this terrible trial in their lives and that His glory may be found throughout the lives of those who have lost so much. "Over 20,000 rescues, 12,000 people in shelters, 6 people dead and many people still missing. They are strong and they are resilient but please keep Louisiana in your prayers. P.S. - All of our family members are safe." 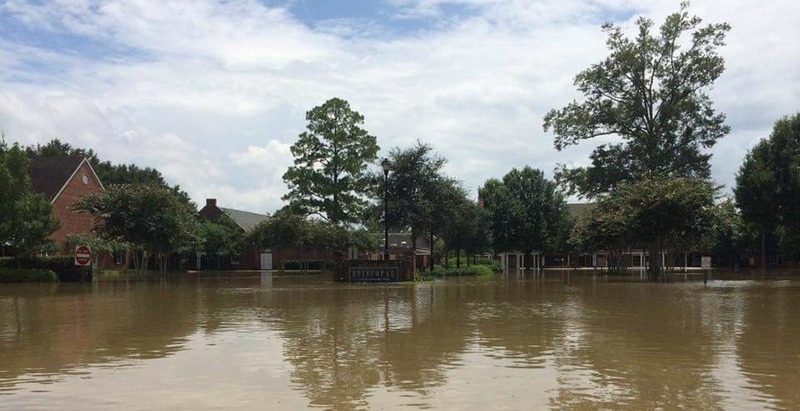 Kim 9:43 am: I just saw a picture taken yesterday morning at Episcopal High and it was completely flooded. That is really close to Dad's office. Not worrying AS much as before. It's a start. Steve 9:47 am: His office is fine. Stop worrying. But yea...Episcopal got screwed. Kim 11:21 am: Stuart is planning to come to BR to help clean out his parents' house. Steve Chance seems to think they will be able to get in on Wednesday so Stuart is thinking about driving over tomorrow since it is a full day drive and then he'd be there for Wednesday. Everything still ok at Dad's? Steve 11:30 am: Some water is going down. Yes, I left there 20 minutes ago. Kim 7:33 pm: Steve Chance made it to his parents' house. Stuart would like to leave for BR tomorrow. He wants me to be there. I still need to figure out what to do with the kids. I guess they will just come to the house with us. We talked some about where the four of us would stay. When we go to Baton Rouge, we always stay at Stuart's parents. Staying at other places each has their own issue and just are viable. Fortunately, Steve's girlfriend was an angel and said that we could stay at her place while we were there. We were so grateful! Stuart's brother reported on the house. The refrigerator was face down on the floor. The windows in the front of the house had all been broken from the pressure of the flood waters on the front of the house. The furniture from the living room and been swept down the hall going to the back of the house. We told our neighbors that we were heading to Baton Rouge to help with the aftermath of the flood. 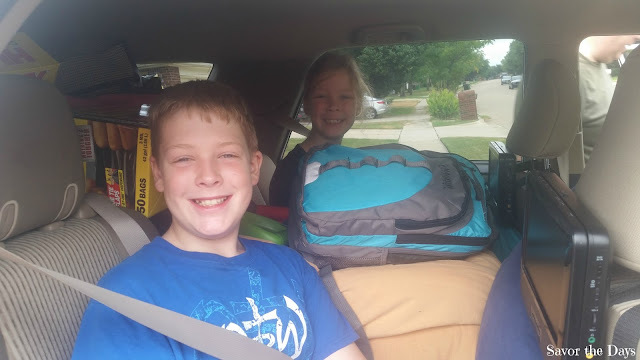 We are in a homeschool co-op with them and our school year was supposed to start today and we were going to have our first co-op meeting on Friday so we let them know that we were going to have to put off our back to school plans for a week or two. They prayed for us and gave us a Walmart gift card to help with the flood in whatever way we could find. 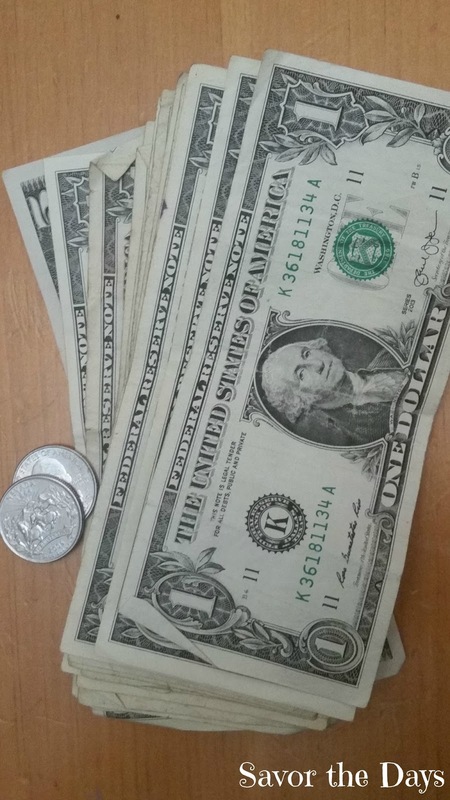 Their sweet kids then brought over their own money that they had pooled together. They just wanted to be a part of the relief efforts. So sweet! Stuart and I started doing Internet searches like crazy. How to gut a house after a flood. How to remove wet drywall. 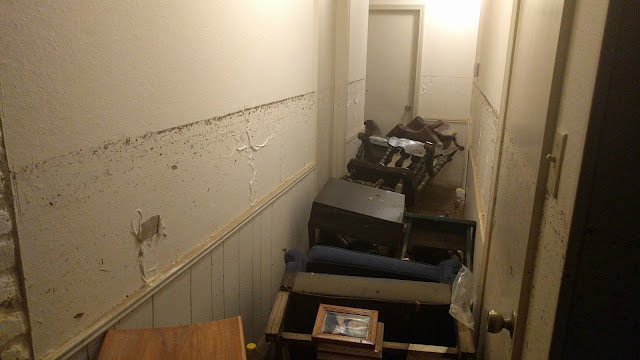 How to prevent mold in house after a flood. Electrical concerns in a flooded house. How to sanitize clothing after a flood. How to restore old pictures after a flood. We knew that some of the home improvement stores in Baton Rouge were probably flooded and if they weren't then everyone would be going there and buying up all the supplies to demo houses. So we decided that before we left Texas we would buy as much of the supplies as we possibly could to be sure we were prepared. We had a card overflowing with contractor tools, trash bags, face masks, sanitizing supplies, etc. On any other day it might have been fun to have such a crazy shopping spree but not this day. We spent about $750 at Home Depot and we would have spent more if we thought we could fit more in the car. Tuesday, 8/16/2016, we loaded up luggage and supplies until there wasn't space for another thing. There were even things crammed between the kids and under their feet. We knew it would be a cramped 9 hour drive but we didn't care. We just wanted to hit the road and get there as quickly as we could. To continue reading the story, please click on Baton Rouge Flood, Part 2.